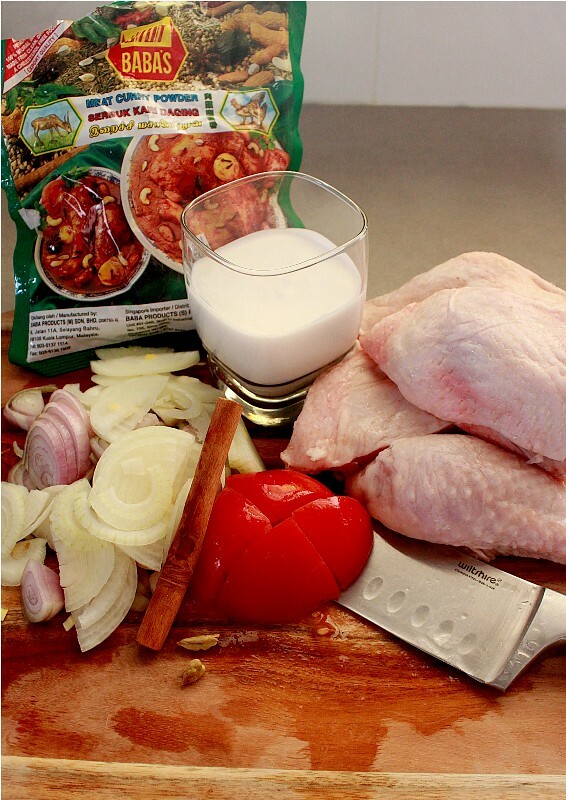 Making a traditional and authentic chicken curry would simply mean staying in the kitchen for hours, pounding fresh ingredients and so forth. These days, you’ll easily find a lot of the supermarkets selling curry powder and curry paste. But I wouldn’t recommend buying curry powder from your local western supermarket though. Try to get them from any Asian grocery or even at your Indian grocer. There are many types but I only prefer one. Baba’s Meat Curry Powder, made in Malaysia. When I first got married to my Lebanese husband, my mother in law made a pot of chicken curry (bought locally). The taste? Well, it didn’t come close to a curry. But then again, I can’t blame her. She’s not familiar with Asian cuisine so she and the rest of the family enjoyed it thoroughly. I just ate in silence. One day, I introduced my version of chicken curry using Baba’s and she fell in love. The look on her face was priceless, it was as though she had not tasted good chicken curry in her life. 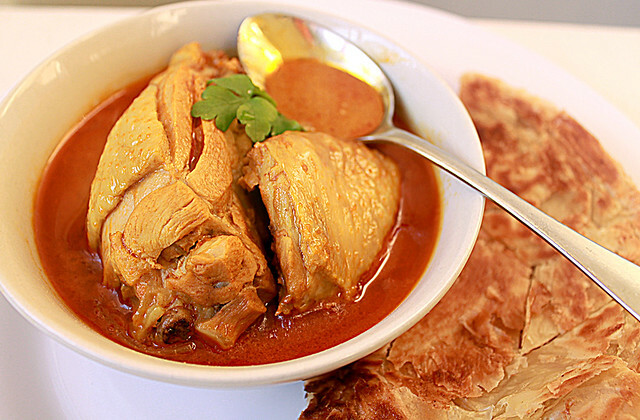 There are many types of chicken curry; dry, wet, yellow, red, brown etc. The different variety of curries made by Malay, Indian, Chinese, Indo also slightly differ from one another. This curry here, I would say its a mix between Malay and Indian. Its so yummy and literally done in 30 minutes (if you use small cuts of chicken). I usually make a big pot so I have leftovers. Serve it with some rice, prata (roti) or yellow glutinous rice and there you go, a meal for the next 3 nights. 1. Heat oil and sautee onions in a medium size pot. Add all the spices and tomato and fry until fragrant for about 5 mins. 2. Add the curry powder, chicken and water and cook on a medium heat for 15 mins. 3. Pour in the coconut milk and stir until well combined. 4. Season well with sugar and salt then simmer for another 10 minutes or so. 5. Serve with rice or pratha(roti/bread). Click ‘Read More’ below to print the recipe and leave a comment. May I (dare) suggest you omit the coconut milk in your next round? But add pounded ginger instead. Your MIL will flip! I promise! Nice photo and I feel like cooking chicken curry for tonight dinner. Once upon a time, the coconut milk was added to help ‘tone down’ the spicy taste of the curry. Thus it is very popular in the South East to add coconut milk to the curry. The real authentic curries do not have a trace of milk nor coconut milk in ’em. And oh, you can actually look at the back of your Baba’s packet and see how they do it! Happy trying! (though you may not like it that way!). But everyone who has tried it love it milk-free! Today I made this curry and it also got rave reviews from my family and requests for many future repetitions, Mashallah. The taste reminded me a little bit of Indian butter chicken. I really liked how the flavor of the spices and the creaminess of the coconut milk really stood out, rather than the flavor of the tomato being prominent (which is common in a lot of curries I have had before). Inshallah I want to also try the version on the back of the baba’s curry packet (suggested by another commenter on your blog), I think that would also taste delicious. Thanks so much for sharing all these yummy recipes. A lot of thanks for your entire work on this web page. My niece really likes setting aside time for research and it’s obvious why. We all know all of the dynamic medium you provide reliable guides via the web site and therefore strongly encourage participation from visitors on this concept so my princess is without a doubt discovering a lot of things. Have fun with the rest of the new year. You’re the one doing a really great job.